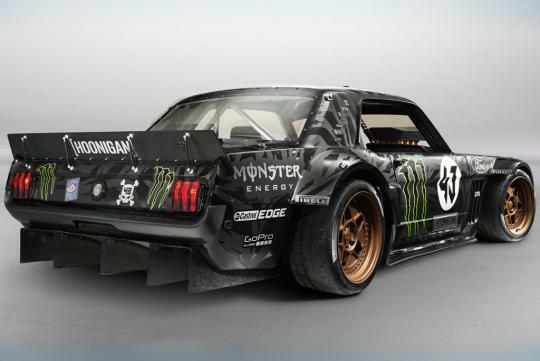 Ken Block's Hoonicorn, which stars in Gymkhana Seven, might still bear a passing resemblance to a vintage 1965 Ford Mustang, but underneath the skin, the car is one of the baddest custom machines to ever do a smoky burnout on the road. The ever enthusiastic British auto journalist Chris Harris is now showing what really makes Block's new ride tick on video, and Harris even gets to go for quite a ride. The only Mustang components really left on the Hoonicorn are the A-pillar, B-pillar and roof, according to Harris. Everything else is ditched to create Block's ultimate Gymkhana tool. The 845-horsepower, 6.7-liter Rousch Yates V8 sits behind the front axle, and the grunt is routed to all four wheels through a Sadev gearbox usually found on Dakar Rally vehicles. The whole drivetrain is packed with cool little touches; like that giant handbrake that also disconnects power from the front wheels when in use. to me it looks like some kind of zombie killer or car from death race.